The third Saturday in May is Armed Forces Day in the USA. The holiday finishes the Armed Forces Week, that starts on the second Saturday of May. 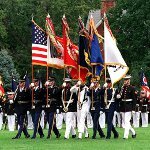 Armed Forces Day was created on August 31, 1949 to honor American soldiers, who serve in the five U.S. military branches – the U.S. Navy, U.S Army, Marine Corps, U.S. Coast Guard and U.S. Air Force. As far as all military branches had their own holidays, Armed Forces Day was created to replace the separate celebrations. Although the aim was achieved, the separate days are still observed within the respective services. National Guard and Reserve units have their own training schedules, that is why Armed Forces Day and Week may be celebrated by them over any period in May. Every year Armed Forces Day is celebrated by parades, air shows, open houses and receptions. The longest running city-parade is held in Bremerton, Washington. This city annually organizes the longest parade, that has already become a tradition since the creation of the holiday.